4 Winning Numbers - Out of 75 balls, Four (04) numbers are selected from one machine. English Letter - One (01) ball is selected out of 26 English letters. Every day 09:30PM on Lanka Rupavahini Channel-1. 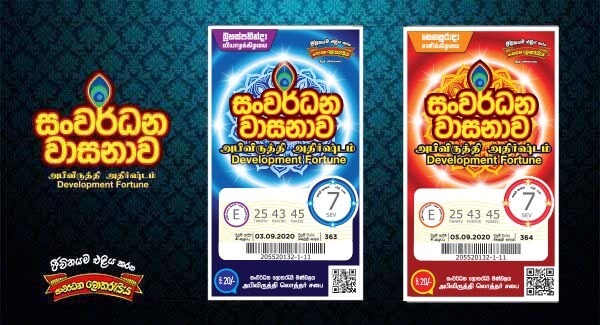 Purple color ticket is drawn on Every Wednesday, Green color ticket is drawn on every Saturday and Blue Color Ticket on every Mondays of the week. 4 Winning Numbers - Out of 60 balls, Four (04) numbers are selected from one machine. Star Sign- One (01) ball is selected out of 12 Numbers, from a separate machine. 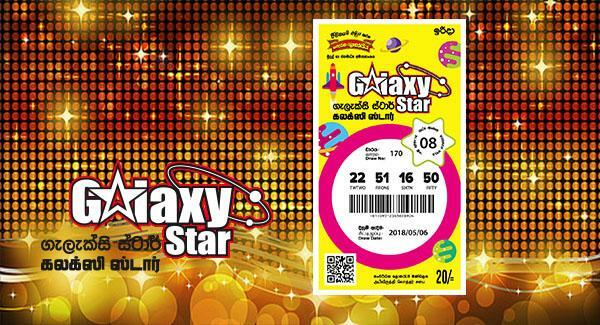 Galaxy Star ticket will be drawn on every Sunday. 9:30 PM on Sundays on Sri Lanka Rupavahini Channel-1. (04 )Four Winning Numbers - Out of 65 numbers, Four (04) numbers are selected from one machine. (01)One English Letter - One (01) letter is selected out of 26 English Letters, from a separate machine. Orange color ticket is drawn on Every Tuesday and Blue color ticket is drawn on every Friday of the week. 1st Stage - Out of 62 balls, four will be drawn. 2nd Stage - Out of 12 Zodiac symbols, one will be drawn. 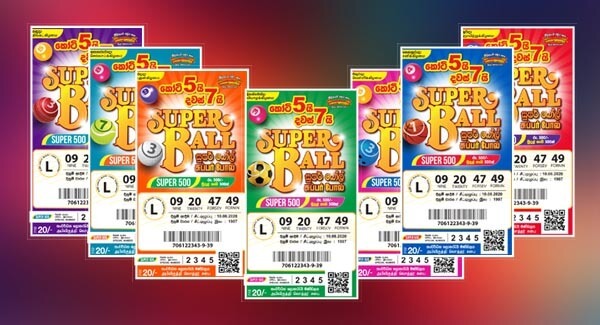 Blue color ticket is drawn on every Tuesday , Red color ticket is drawn on every Friday, Purple color ticket is drawn on every Sunday and Green color ticket is drawn on every Wednesday, Brown color ticket is drawn on every Thursday of the week. 4 Winning Numbers - Out of 77 balls, Four (04) numbers are sellected from one machine. English Letter - One (01) ball is selected out of 26 alphabets, from a separate machine. Blue Ticket on Saturday, Red Ticket on Sunday , Green ticket on Thursdays And Purple ticket on Monday. 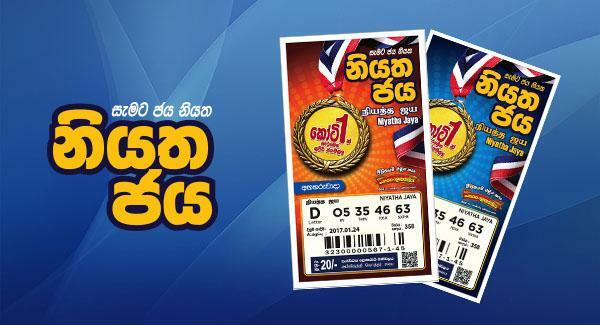 09:45PM on Monday, Thursday,Saturday and Sunday on Sri Lanka Rupavahini. 1st Stage - Out of 80 balls, four will be drawn. 2nd Stage - Out of 26 English Letters, one will be drawn. 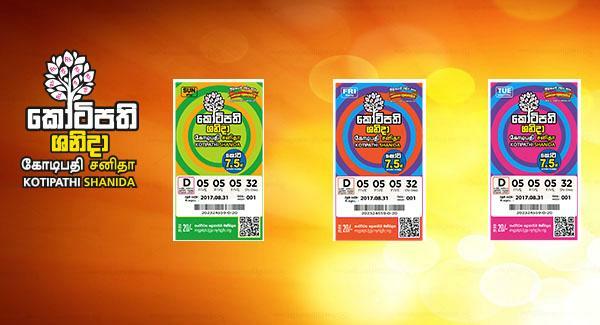 Pink color ticket is drawn on every Tuesday , Orange color ticket is drawn on every Friday and Green color ticket on Sunday. 3 Winning Numbers - Out of 70 balls, three (03) numbers are selected from one machine. Fate Number - One (01) ball is selected out of 9 Balls, from a separate machine. English letter - One (01) ball is selected out of 26 balls. Blue ticket will be drawn on every Wednesday and Red ticket will be drawn on every Saturday. 3 Winning Numbers - Out of 55 balls, Three (03) numbers are selected from one machine. English Letter - One (01) ball is selected out of 26 alphabets, from a separate machine. Lucky Day – One (1) ball is selected out of 7 days from a separate machine. 4 Winning Numbers - Out of 70 balls, Four (04) numbers are selected from one machine. English Letter - One (01) ball is selected out of 26 alphabets, from a separate machine. 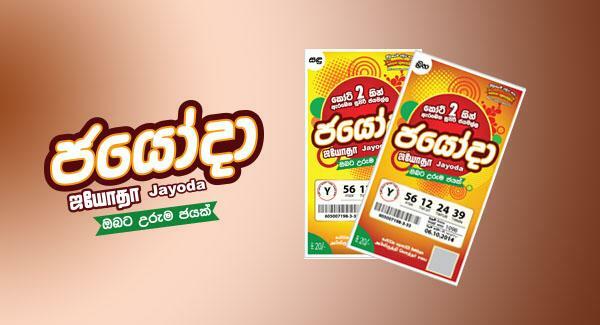 Yellow ticket will be drawn on every Monday and Orange ticket will be drawn on every Thursday.